Journalist Gaston LeBlanc (Arthur Hansel) has returned to France after many years living in America. Commissioned by his newspaper editor to report on the unorthodox methods used by the sinister Dr Maillard (Claudio Brook) who runs a remote institute for the insane, Gaston soon discovers, to his cost, the truth in the expression that lunatics have indeed ‘taken over the asylum’. Sometimes the best films are stumbled upon purely by accident: new titles may be caught purely by chance whilst receiving a limited cinema release, coming and going just as quickly with little or no fanfare. Past oddities – which languish in the no-mans-land of internet obscurity – pop-up unheralded via random Google or You-tube searches. One film which falls into the latter bracket is the horror The Mansion of Madness – also known under the title House of Madness. Made in Mexico the film, based on the Edgar Allan Poe short story ‘The Torture Garden of Dr Tarr’, was shot in English and later dubbed into Spanish for the Mexican home market. This somewhat convoluted production procedure may help explain a storyline which often errs on the side threadbare at the best, and performances that, for much of the time, are decidedly hammy and amateur: various fight and chase scenes which litter the action as characters attempt to escape bizarre scenarios for any number of reasons, often running around in circles only to end up back where they started, take on an almost farcical ‘Keystone Cop’ air. Strangely though this simply adds to a story where a sense of the surreal and weird is perfectly in keeping with the freakish setting and source of the story. The overwhelming touch of Poe – America’s dark prince of melancholy literary horror – is unmistakeable throughout the film. 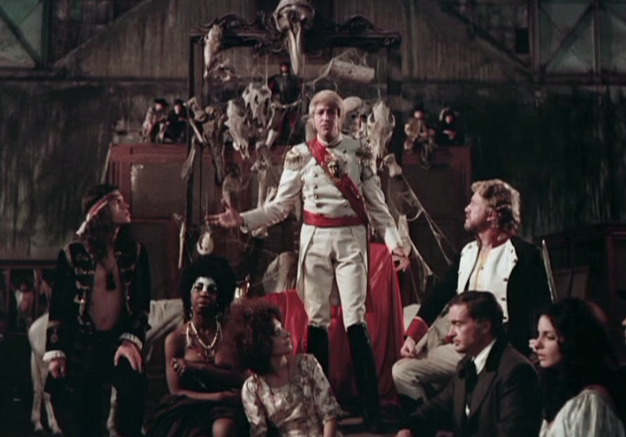 The similarities between this outing and the series of films which Roger Corman did for AIP a decade earlier are more than obvious: mist shrouded mansions, dark, dank, subterranean dungeons housing any number of foul and diabolical tortures as well as countless lost and forgotten souls. It is also the theme of madness – the story being set, for the most part, within the rambling confines of a secluded, rundown, home for the insane – which allowed the filmmakers (director Juan López Moctezuma, cinematographer Rafael Corkidi and production designer Gabriel Weiss) free rein to create a vision which verges on a cinematic ‘hell on earth’. Reminiscent of the tortured visions seen in the cult film Frankenstein’s Army (2013), here we have a vaulted chamber lined with row upon row of glass boxes encasing an array of unfortunate inmates, hapless victims bound upon great wooden frames and left to rot in tomb-like underground cells, and a greenhouse shrine in which some weird and perverse ritual takes place involving a naked girl and several bunches of grapes. From the opening scenes set on a country road which lead past the great gates of the asylum, until the climatic scenario during which pandemonium ensues after the innocent victims gain their freedom and set about exacting revenge upon their captors, the whole film is seeped in a sense of darkness, futility and just sheer creepiness. Many of the cast look as though they’ve only recently graduated from the local amateur dramatics society. Even American actor Hansel – who gives a commanding performance as Gaston, the journalist inadvertently embroiled in the sinister happenings at the asylum – and Mexican Brook – suitably manic as the master of the said establishment – look at times in danger of becoming overwhelmed by the whole craziness of the situation. However, as madness is the power behind the story, any lack of professional prowess on the part of those on screen simply adds to the overall weirdness. Read on-line reviews and comments about The Mansion of Madness and you’re left with the sense of an odd and confusing film, derided (and perhaps misunderstood) by many. However, if you manage to see beyond its jarring shortcomings, you will be treated to a film which is not only visually stunning, but that also imbues an air of disturbing melancholy which will haunt you for days to come.